But man, we (I) don’t do a very good job of that do we? 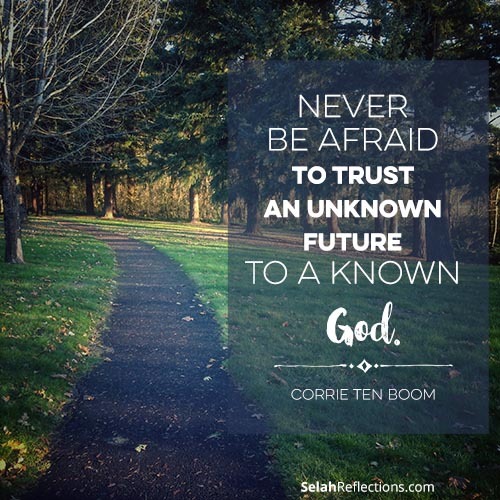 And coming from Corrie ten Boom kind of puts us (me) in our places doesn’t it? Talk about someone going through a period of time where day to day life was an unknown. This is a quote that hits me and makes me think when I read it. I even included it in my “I Will Trust In You” calendar. It’s an important message that we need to remember. This has been a year of uncertainty both around the world and personally. There were days I wondered what was going to happen next and not always knowing where I would be from one week to the next. There was a lot of travel happening! Family emergencies slowed down, health improved, and solutions were provided. And provided in ways that was totally a God thing and nothing we could have orchestrated. In the past few months my car started to give major hints that she was ready for a new owner that wouldn’t make her go on long road trips every weekend. Finding the new-to-me car that I have now took months! But it happened, and in a beautiful way that I had peace about. What a relief to have that decision made and taken care of. Thankfully we have a patient God who quietly reminds us where our focus needs to be. As I’ve reflected over this past year I’ve realized a few important things, there are a few habits I have cultivated that have made a huge difference and has helped ease the panicky days. Now I’m definitely not perfect in this area, there are days I miss. What a difference it makes when I do have that daily time. To be totally honest, there was a stretch of time where my prayer was, “Help me WANT to take the time to spend my mornings with You and not feel like I have to”. Thankfully that prayer was answered. This one tends to be hit or miss when life gets really busy, but I always find my way back to journaling several times during the week. I know that when I take time to journal, express what I am feeling, and even write out my prayers, it makes a huge difference. Writing helps me to stay present… I’ve been known to fall asleep while praying 🙁 or at the very least have my mind drift into another line of thought. Writing out my prayers gives me focus and helps me to stay on track. Even on the crummy days there is always something to be grateful for. In my journal I’ve started a section “Today I’m grateful for…”. By taking the time to write out this list, it helps me see the good and the daily provisions I so easily take for granted. Thismight sound odd, but pattern prayers really do help! Especially on the days where overwhelm sets in. On days like this I’m not even sure where to begin. Using a pattern also helps to get the focus off of me and on to others and celebrating who God is. I’ve tried several patterns over the years but my favorite right now is Rachel Wojo’s CH@T Prayer. I think there are times we feel too timid to approach the Throne of Grace and simply ask for what we need, so we get generic in our prayer time in order to not look so selfish. But you know what? Getting specific opens up doors to understanding. Once you start getting specific (especially when you write it out!!) you can see pretty quickly the motive behind the request. Sometimes that door opens and shows you that you are being selfish and sometimes it opens up doors where God blesses you. Answered prayer, whether it is a yes, no, or not now, helps us learn to trust our known God. 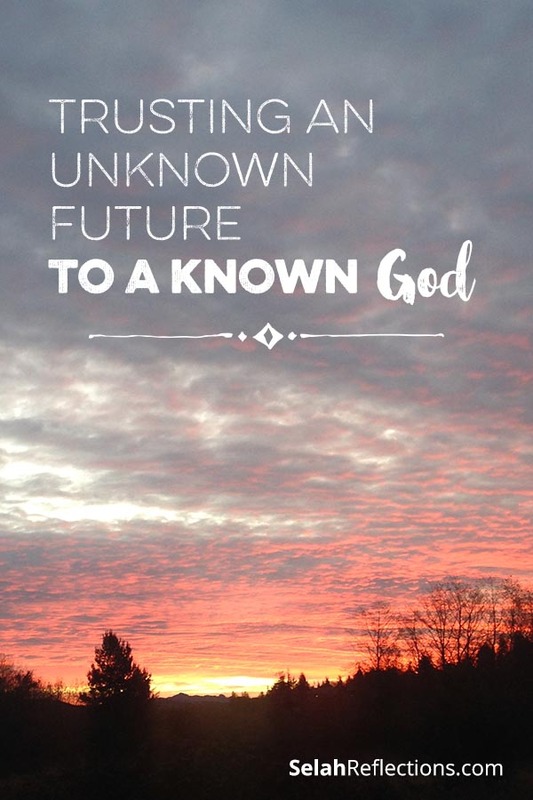 So today, whatever you are going through, take some time to pray, read a Bible verse, journal and remind yourself that we can trust the unknown to the KNOWN. Here are a few more resources on pattern prayer and learning to trust.